This recipe was inspired by my recent travel to Japan. Finding a good noodle soup for lunch after a hard karate training session was easy, but finding a vegetarian version – not so easy. 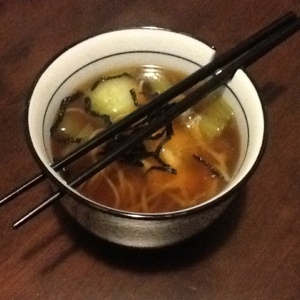 I’ve been experimenting at home and have come up with this quick, easy and tasty Japanese-influenced noodle soup (and it’s gluten-free too). Boil water in saucepan. Add noodles and carrot, cooking until noodles have softened. Add tamari, herbs and bok choy, simmering for 5 minutes. 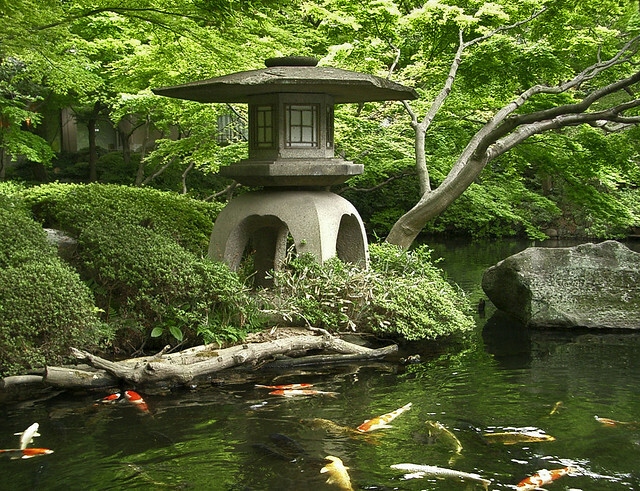 Off to Japan: a land of karate and herbal medicine. Gosh! It’s only one week until I fly off to Japan for two weeks! What will I be doing there? Well, I’ll be joining fellow karateka from around the world for some intensive karate seminars with some of the Goju masters. I’ll also be taking the opportunity to learn more about Japanese medicine and vist some medicinal herb gardens. And rest assured, I will return with lots of photos and stories to share. Stay tuned! So, the dates to note are: I’ll be away from HealthWise Clinic from Monday 2nd July and will return on Wednesday 18th July 2012. Acupuncture and massage bookings can be made by calling the clinic on 07 3839 1077. I was very lucky to get some ninja bread cookie cutters for my birthday, so I’ve put them to good use by making gluten and dairy free ginger bread. 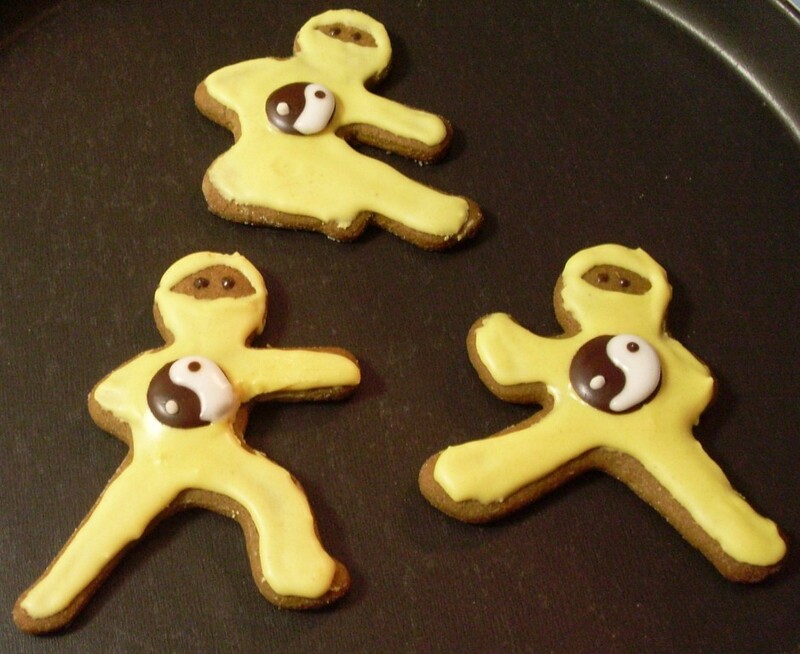 As you can see, these are no ordinary ninja bread, they are Wellness Ninjas. The Wellness Ninja Bread have some special ingredients in them including: brown rice flour (gluten-free and high in fibre), molasses (high in iron), ginger, cinnamon and cloves (these spices all support digestion and promote circulation) and tumeric (as a natural substitute for yellow food colouring – also promotes digestion and is an excellent anti-inflammatory). These ninja bread should be saved as a treat though, despite the good ingredients found in them, they do contain quite a lot of sugar (particularly when iced). Cream nuttelex, sugar, spices and salt. Add egg and molasses, mixing well after each addition. Add sifted flour, baking soda and baking powder to the mix. Stir until mixture is even in consistency and colour. Refridgerate mixture. Flour a bench surface and rolling pin. Take one third of the mixture and roll it on prepared bench to 3-4mm high. Use ninja biscuit cutters to cut dough and carefully transfer them to your prepared biscuit trays. Repeat until all dough has been transformed into ninja shapes. Bake for 8 to 10 minutes. When golden brown cool on rack, before icing. Melt dark chocolate in a heat-proof bowl over a saucepan of water (don’t allow the water to be deep enough to touch the bottom of the bowl). When melted, set aside. In a new bowl, whisk egg whites until soft peaks form. Add sifted icing sugar and mix well. Remove one third of the icing and set aside in a snap lock bag with one corner cut from it for you to pipe the icing from. To the remaining two thirds add 2 tablespoons of water or enough to give icing a spreadable consistency. Halve this mixture, and to one half add 1-2 teaspoons of turmeric until desired yellow colour is reached. Drop chocolate into little circles (the size of a 5 cent piece or about 1.5 cm in diameter) onto a tray covered with greaseproof paper or foil. Freeze for a few minutes until hard. With the spreadable white icing, cover one half of the hardened dark chocolate circles with the white part of the yin yang symbol (as per image). Freeze again until needed. Ice the ninja bread with the yellow icing leaving space for their eyes (as per image). Very gently place the hardened yin yang symbol onto the yellow icing before it dries. Add the final touches to the ninja bread by piping the white dot onto the yin yang symbol. With a skewer you can add the dark chocolate dot to the yin yang symbol and make two dots on the face for eyes. Enjoy your Wellness Ninja Bread! Believe it or not, traditional karate (such as Goju Karate Australia) has a lot in common with acupuncture. Each places great importance on the breath, focus/intent and flow of Qi (or Ki or vital force). They are considered both an art form and a science, being constantly questioned, refined and developed by the practitioner and their peers and mentors. Even the acupuncture points and meridians are used in karate. The acupoints and channels influence the flow of qi in the body, depending on how they are stimulated determines the result of their use. In acupuncture, the acupoints are carefully selected and manipulated for their healing influence, in karate they become strike points or reflect body positioning and movement. I find that practising karate improves my acupuncture through experience with energy flow (e.g. posture and breathing) and that knowledge of acupuncture points and channels benefits my karate. That’s why I love immersing myself in both! Practitioners of Kung Fu, Qi Gong, Tai Chi, Aikido and other traditional martial arts all experiment with utilising this flow of Qi or Ki in their training but also in other aspects of their lives. How do you unlock your Qi, Ki or Life Force? A very athletic (but non-ninja) friend called me on the weekend searching for a fast cure for bruising. She had taken a bad tumble from her bicycle the week before she was to compete in a big triathlon. She had bad bruising developing behind her knee that covered most of the back of her knee and part of her thigh. With some wisdom from both the Chinese and western herbal medicine worlds, the bruising didn’t get anywhere near “as ugly as she had expected” and she’s been back on the bike painlessly getting her last training in before the big event this weekend. Ice. But don’t overdo it. Ice can be used in the first 24-48 hours of an injury occurring. If the injury feels hot, looks red and is continuing to swell, you can apply ice. Compression bandaging is useful at this time too. There is no need for ice once these symptoms have stopped. Arnica. Arnica is known as ‘the herb for bruising’ in western herbal medicine. I like the Sunspirit Arnica Ointment, which can be smeared over the injured body part (e.g. knee or ankle) and then wrapped with gladwrap and left over night. It contains a few other herbs to aid healing and give some pain relief. Arnica can also do wonders for bruising when taken internally as a homeopathic remedy. This gives you a way to tackle the bruising from the inside while you are busy addressing the local area of the trauma. Liniment. Traditional Chinese Medicine offers us many liniments that lay claim to reducing bruising. 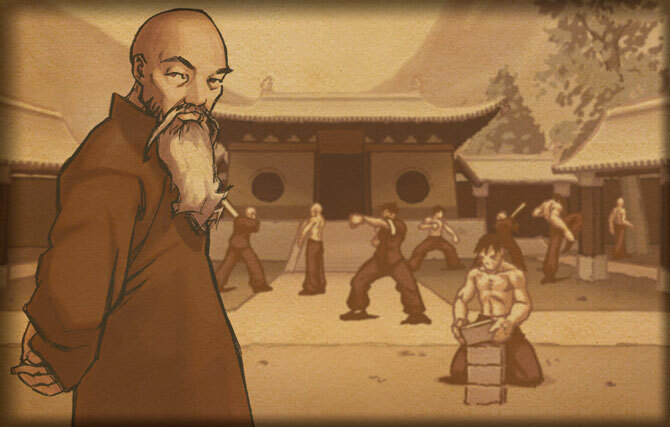 The most famous of these amongst martial artists is ‘Dit Da Jow’ or ‘Hit Medicine’. Some of my favourites that are more easily available are Zheng Gu Shui and Po Sum On. Liniment needs to be applied to the local bruise area every few hours, throughout the days following the injury. The herbs used in these liniments aim to promote blood circulation and thus disperse the blood that has stagnated. Rubbing. Yes, we can rub the bruise out. Sounds painful, and it can be, but it works a treat. You need to take some of the liniment referred to above and moisten the bruised area. Then place your thumb or fingers in the centre of the bruise, apply deep pressure and massage towards the outside of the bruise. You can use a deep, flicking movement to do this. We are aiming to move the stagnant blood away from the site of the trauma. The bruise will change colour and intensity fairly quickly with this technique. A note of caution. Rubbing out a bruise may not be suitable on acute serious injuries. Heat. So it’s ice that we use first of all, and then later we apply heat. Ice is used to stop the swelling and bruise developing, and then we can go straight into applying a heat pack to reinvigorate blood circulation. The idea is to slap on some liniment and apply your heat pack on top. This will aid circulation to the area and the warmth will prepare the bruise nicely to be rubbed out. A note for people who bruise easily. If you are prone to bruising with light touch or without recollection of a trauma it may indicate that you have an underlying condition affecting your blood clotting or blood vessels. Sometimes medications and even supplements (e.g. fish oil) or herbal medicines (e.g. ginkgo biloba) can contribute to thinning of the blood. A tendency to easy bruising should be discussed with your acupuncturist, herbalist or general practitioner. As with most health conditions in Traditional Chinese Medicine, tiredness can have many different diagnoses and therefore treatments. Your body’s energy or life force is known as ‘Qi’. It powers your organs and entire body to function correctly and give you vitality. If a person does not have enough Qi they will be tired. If a person has enough Qi but it’s not circulating well or has become ‘stuck’ they may also seem tired. Qi also interacts with your blood by giving your heart the force to pump your blood around the body. In turn, the blood nourishes the Qi. So, poor blood quality or quantity can also contribute to low energy (eg. anaemia). Another factor to consider in the case of tiredness may be when an excess of fluids in the body accumulates creating the sense of heaviness and preventing Qi from circulating. If you are prone to suffering from bouts of tiredness, here are some ideas applicable to some common types of tiredness that I see regularly in my clinic (which have no known cause eg. lack of sleep or other disease cause). Improving digestion and food intake is important. Eat well, that means consuming warm, cooked and easy to digest foods such as soups and stews (that are not too rich). Good foods to include are orange coloured vegetables (eg. pumpkin, carrot and squash), root vegetables (eg. sweet potato), naturally occurring sweet foods (eg. corn, figs) and some lightly pungent foods to aid digestion (eg. cinnamon, ginger, fennel and onion). Licorice tea is an ideal beverage. Breathing deeply helps to cultivate Qi. Practice exercise that helps to build Qi rather than use it up. Yoga, tai chi and qi gong would be more beneficial than running or an aerobics class. Eating well is also important for this type of tiredness so follow the recommendations above. To boost the blood, increase naturally occurring dark coloured foods especially those that are red (eg. cherry, beetroot, dark leafy vegetables), iron rich foods (eg. molasses, dates) and adequate protein (eg. eggs, legumes, tempeh). Nettle tea makes a good blood nourishing drink. Often herbal medicine may be required to nourish the blood. Muzzy head, limbs feels heavy to move and fluid retention. Getting the body moving will benefit this type of tiredness. Increase cardiovascular exercise (eg. walking, jogging, cycling or aerobics). It may be hard to start but afterwards these people work up a sweat they will feel much more energised. Eat less. Only eat until you feel 80% full. Decreasing rich foods in the diet is the key here – eat light. That means reduce or eliminate dairy, fatty foods and cooking methods, excessive sweet foods and drinks (including very sweet fruits such as bananas) and fruit juice. Beneficial foods will promote digestion and loss of excess fluid. These foods include those that are bitter (eg. rocket and other greens), some fruits that aid digestion (eg. pineapple and papaya) and some pungent foods such as mustard, horseradish and those from the onion family. Drink green tea or dandelion coffee. Once again, getting the body moving is essential. Cardiovascular (eg. those listed above and martial arts) and stretching forms of exercise (eg. yoga) are perfect to promote a sense of more energy. Breathing exercises may be useful in moving Qi. Any activity that is useful for managing stress and alleviating emotional ‘stuckness’ is beneficial for this type of fatigue. Eg. yoga, massage, acupuncture, meditation, creative projects or counselling. This pattern often has an emotional cause such as frustration or anger that needs to be addressed. To book in for acupuncture at my Launceston clinics (House of Prana or In-Balance) or for further information on Chinese Medicine contact Dr Sarah George (Acupuncture). Sarah is an AHPRA registered acupuncturist, Chinese medicine practitioner and massage therapist.